I had shot some monochrome photos to post tonight for Lens and Pens by Sally’s photography challenge. I changed my mind when I was going back home and passed in front of a park and stopped to appreciate the scenery. It was the end of a working day for many people. The streets were busier. Bikers getting back home. Pedestrians running to catch the trams. 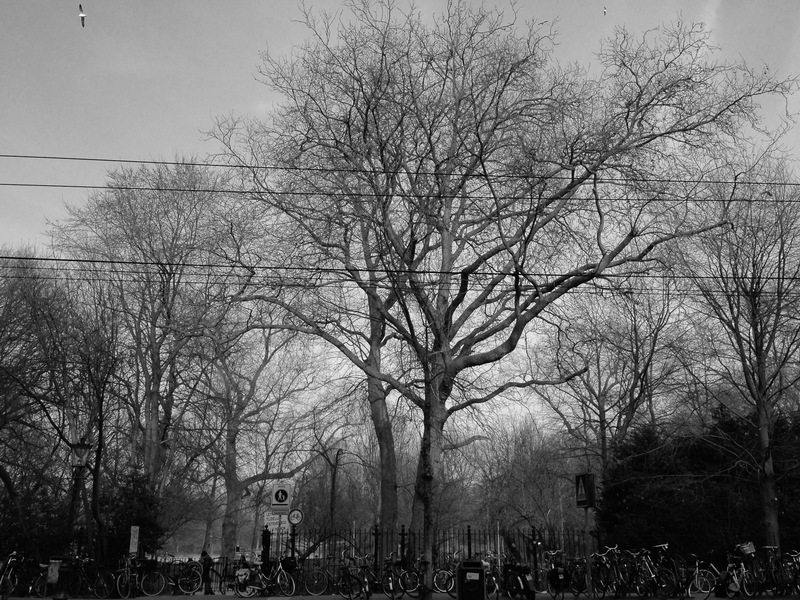 The park’s majestic trees stood in the background of cars, trams, bikes and people, composing a beautiful image of transition. Transition from day to night. From playing daily roles to resting and recovering to start a new day. These images made me think deeper of transition, which in turn evokes possibilities, discoveries, growth and renewal. It’s a good feeling to close the play. I shot with an iPhone 5. I used the iPhone camera for the first shot. I edited for B&W and increased contrast. I used for the first time a new app for BW shots, Hueless, to capture the 2nd image. I am happier with the results from the 1st image but the 2nd seems overexposed. What do you think? Any advise? I am joining Lens and Pens by Sally, who hosts each Monday the Phoneography and Non-SLR Digital Devices Photo Challenge. Following the link you will learn all you need know about it. The schedule theme for this week’s challenge is: Black & White. They both have their charm. The second has greater appeal to me, because I can determine various layers of contrast and shapes that interact. Happy Photo Challenge. Thanks for commenting, Sally. There isn’t a better way to learn than through the eyes of highly skilled photographers like you. Much appreciated. I agree that the second one looks overexposed at the top. It looks like it’s applying high contrast – the dark areas are quite dark and the light areas are very light. You know, I just saw this again on Instagram and I quite like the overexposed nature of the photo. 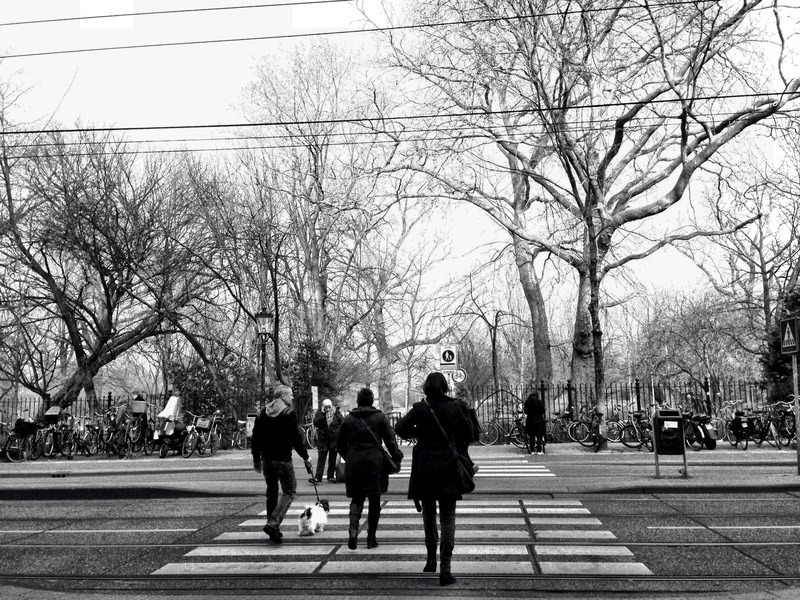 It makes the people and the puppy and the pedestrian crossing really stand out. Very cool. It looks indeed better there. I found the same. I tweaked it again by editing the contrast once more and it worked fine. You’re so right about that. And thats exactly what I most loved about this composition. Thanks. I could have reduced this overexposure before shooting. Doing it while editing wasn’t ideal. I used the BW app for the first time, and as you know me well, I didn’t try to understand how it works but just started using it. I discovered later that you really need to manually set exposure, ISO, etc. before you shoot because the app doesn’t have editing. I used an auto function that obviously did handle the sunlight well and did the editing using another app. Too complicated. Oh that sounds cool that you can set things manually!! Regardless, it’s a beautiful photo and a great scene. A photographer suggested this app to me. It seems great. My behavior wasn’t. Thanks, hun. You’re a great motivator. I’m doing pretty good today. The sun is shining and the weather people promised 16C by 3pm, sooooo. What else can I wish for? That the same happens when you are here in April. Does that mean that you will hate 10-15C? How wonderful to live in Queensland! Having fun in Sydney?? Heheh, let’s have red wine so we don’t notice! Oh and yes, all work in Sydney it it is still good fun. Are the boys there too? In the office today and had dinner with my boss this evening. In the lab again all day tomorrow then back home late tomorrow night. Ok, serious business with the boss this time! Have safe travels! I like them both, Lucile. I think you might have a couple possible “fixes” for the second. You could crop it a bit on the top or you could try darkening/adding shadow to the overall photo and see whether that makes the top feel less over-exposed. Thank you so much for taking the time to help improving this photo. I’ll try your fixes and see how it looks. I wasn’t using a god editor though and couldn’t do much. I like them both! I wondered which park it is, and thought of the Oosterpark. You have a fantastic memory to remember that; it’s indeed the Oosterpark. I was in front of the OLVG hospital. My favorite is the first, when I clicked on it to enlarge it just opened up all the layers. Both great shots. It is true. One needs to enlarge it to capture the different layers. Thanks much Angeline! I do appreciate you taking the time to comment. I like the second photo, Lucile! It is eye-catching. I can’t tell you why, it just is!! It seems to be the one that most like. Composition wise its also my preference although I’m a bit unhappy with the exposure. I like them both but the people in the second make it more interesting. It’s a little overexposed at the top but not so noticeable as your eye is drawn to the people. You and DJ together in Amsterdam – how exciting! You’ll have to post a photo of the two of you together. I was only thinking recently that the WordPress gang should have a get-together somewhere in Europe sometime in the future. Thanks for commenting and making suggestions. Much appreciated, Michelle. Yes, we’ll meet up first in London with Justine (do you know her?) and from there we will come to Amsterdam. We will post a photo especially for you! It’s indeed a great idea to organize a get-together. I’d love that. Let’s nurture this idea! Yes, I do follow Justine although don’t talk with her as much. How wonderful – enjoy your time together. Thank you so much for taking the time to comment and help me learning. Much appreciated.